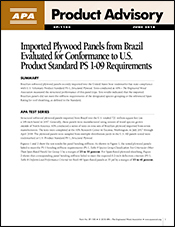 APA-trademarked plywood and OSB panels are manufactured to stringent product standards (such as Voluntary Product Standard PS 1, Structural Plywood and Voluntary Product Standard PS 2, Performance Standard for Wood-Based Structural-Use Panels) and are subject to APA's rigorous, state-of-the-art quality verification and testing programs. Look for concrete forming panels bearing the APA trademark. It appears only on products manufactured by APA members committed to APA's rigorous program of quality inspection and testing. Where do I find APA-trademarked concrete forming panels? APA-member manufacturers are located throughout North America. Hundreds of distribution centers throughout the U.S. and Canada inventory a wide selection of concrete forming panels and engineered wood products. Industrial users can rely on a consistent source of readily available, quality products. Find APA members that make concrete forming panels. Where can I find technical specifications on APA-trademarked concrete forming panels? 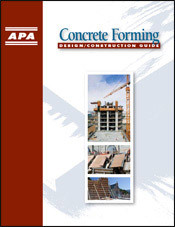 Download APA’s free Design/Construction Guide: Concrete Forming, Form V345 which contains grade information, form maintenance recommendations, design data and several project case studies. What is O & ES or OES? Oiled and edge-sealed. Surfaces of concrete form panels are lightly coated with oil and the edges sealed, if specified. How many pours can I get out of a sheet of concrete forming plywood? Many factors affect the number of pours expected from a sheet of concrete forming plywood, including the expected finish on the concrete, the overlay (if any), the concrete mix, maintenance and care, and other factors. Up to 10 pours can be expected from a B-B grade non-overlaid panel. With reasonable care, HDO Plyform will normally produce 20 to 50 reuses or more. Some concrete forming specialists achieve 200 or more pours with good results. Consult with your supplier for advice on maximizing the number of pours. What is “Sized for Spacing”? Sized for Spacing is a notation in the panel trademark indicating that the panel has been produced at a length and width slightly less than traditional nominal length and width. This is done to facilitate proper panel spacing during construction in order to accommodate natural panel expansion that occurs as the panel acclimates to construction or in-service moisture conditions.